Ekiti State Governor Ayo Fayose has hinted on his readiness to quit the People’s Democratic Party (PDP) over the protracted factional crisis tearing the green-red-white umbrella to shreds. The governor has also showcased new campaign buses which have no PDP name and logo fueling speculations that he had perfected plans to move to another party. Buses including 35-seater Toyota Urvan and 18-seater Toyota Hiace, otherwise known as Toyota Hummer bus are parked in the premises of the Government House. The buses which are painted lemon green are embossed with the picture of a smiling Fayose wearing black “danshiki” with red embroidery and waving. The non-appearance of the PDP name and logo are tell-tale signs that Fayose has made up his mind to quit the umbrella party. But Fayose who hosted students and youths Wednesday evening at Government House grounds whose ages range between 18 and 22 emphasized that he won’t wait a day longer in the PDP if his faction loses the case at the Supreme Court. Many of the students who were attracted to the Government House with the governor’s promise of giving the first 300 that arrived laptops went home disappointed when the promise was not fulfilled. Fayose promised to organize a raffle draw to determine the laptop winners which did not go down well with the youths who were eager to go home with their prizes. Addressing the audience earlier, Fayose He also dropped a bombshell that stakeholders in the party loyal to Senator Ahmed Makarfi will defect to another party, if Senator Ali Modu Sheriff wins the appeal pending at the apex court. He did not mention the party they (Makarfi loyalists) would defect to in the event of a loss to Sheriff. 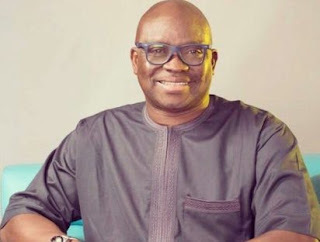 When asked whether he has the intention of leaving the PDP as being rumoured, Fayose stated that no law prohibited him from defecting if the PDP can’t be a veritable platform for him to advance his political frontiers in 2018. Fayose said: “I am still a member of the PDP and still the Chairman of the PDP governor’s forum, there are no two sides to it. “But the strategy for 2018 poll is strictly my own business. No law says I should not run on the platform of another party if the PDP is no longer a right direction depending on circumstances.